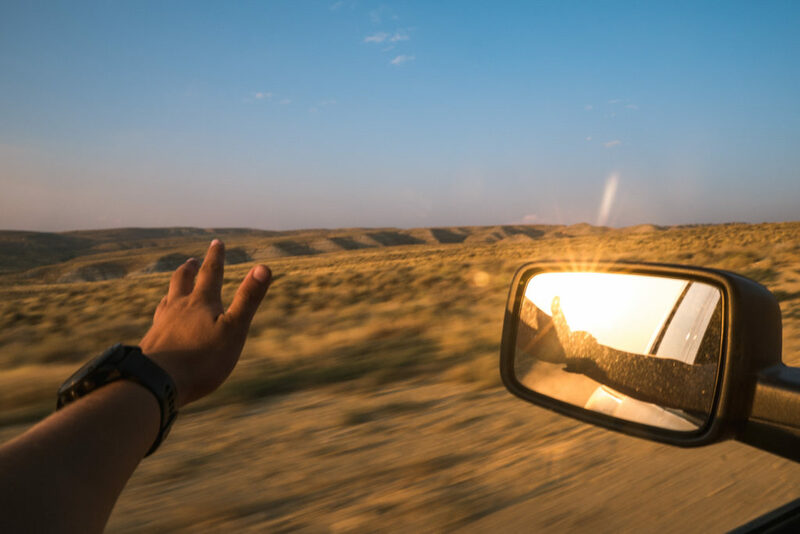 After two weeks of finding my #CalloftheWY while working with the Wyoming Office of Tourism, I headed into my last and final week and to be honest, I didn’t even know what to expect at this point. This trip had already been a dream and for me and I was convinced that there was no way for it to get better. I was wrong. The first two weeks had me dancing in the Wind River Range, but now it was time to head to the deserts of Wyoming only a few hours away. The shift in landscapes was quickly apparent and drastic. I had transitioned from the mountains to a rugged and uniquely beautiful desert-scapes with hoodoos that looked like they belonged in the southwest U.S., not Wyoming. 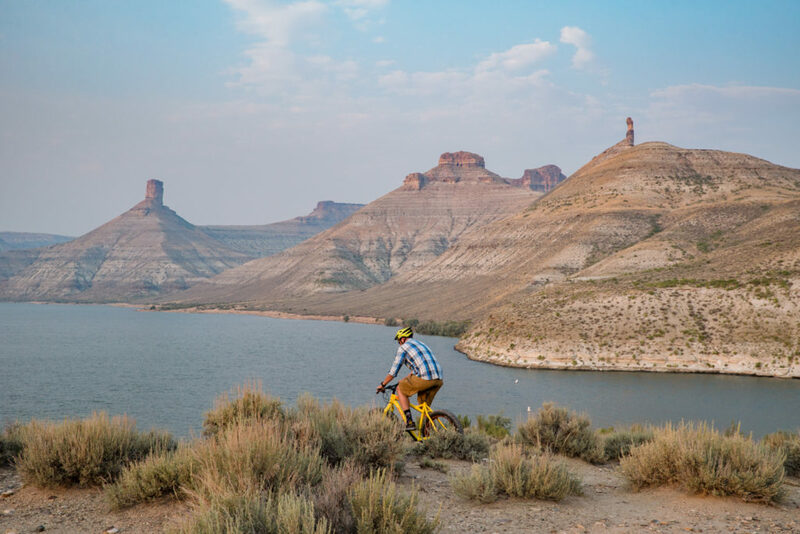 My first night I pulled into Rock Springs, Wyoming, and rented a fat tire bike and headed out to my tiny home campsite in Firehole Canyon in theFlaming Gorge National Recreation Area. Upon rolling into camp, the landscape took center stage and was far beyond my expectations. I was expecting a reservoir area like one of those I grew up with, complete with a barren landscape and a large body of water. Instead, I was greeted by large hoodoo-like structures that I’m used to seeing in southern Utah and Arizona. The light of sunset was dancing off of the chimney rocks and I pulled the fat tire out of the truck for a ride around camp. It was my first fat tire ride and I instantly fell in love with it. As I packed up for the night a random text came through on my signal-less cell phone. It was my buddy Joe and he was about to pass through Rock Springs on his way home to Seattle and saw on my Instagram story that I was in the area. I quickly started running around camp trying to catch the one bar of signal to text him my location. While I wasn’t sure if it had gone through, sure enough, Joe showed up in camp an hour later. What was going to be an early night ended up with sitting on the porch of the tiny home with a bottle of whiskey and telling stories of the summers we’ve had. 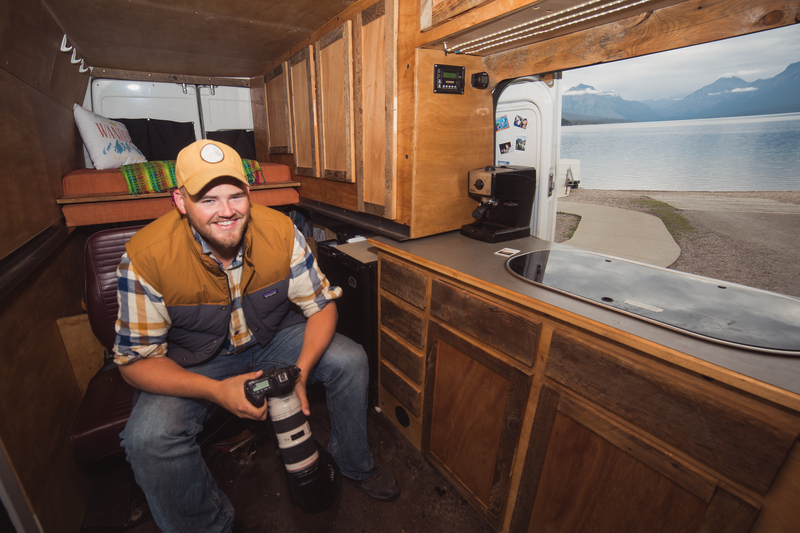 He was just coming off a one-month project photographing rodeos for Wrangler—including Cheyenne Frontier Days —and I was eager to listen to the tales from the road. 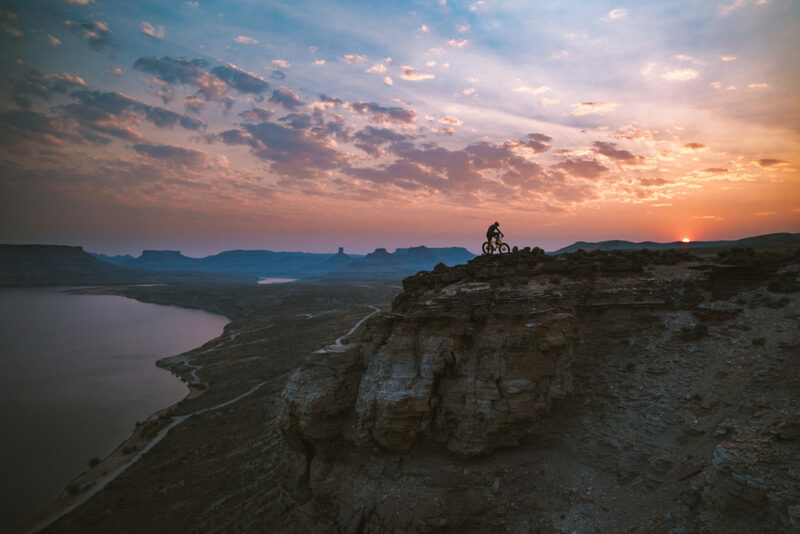 The next morning came far too early, but we tossed the fat tire bike in the back of Joe’s truck (which has doubled as his home for the last month) and we headed up some Wyoming backroads as the sky began to light up. We joked about who decided to make some of these dirt roads as some seemed to crawl straight up the mountainside, and then we took one which lead to one of the best views of the whole gorge and suddenly, the design of these roads made total sense. Joe helped me take some cycling shots and I took some shots of his truck and landscapes around. The morning light was strengthened and given a yellow hue by the smoke in the air but eventually we retreated to the tiny home. Coffee was brewed and bacon was fried up as I bid Joe goodbye so he could continue making his way home. I headed back to town to drop off the bike and get some editing down at the newly opened Coffee Depot. (Sidenote: have you picked up on the fact that I have a true love for coffee?) To end the night, I headed to the Sweetwater County Fair—also known as Wyoming’s Big Show—to relive growing up in the 90s with a Bush concert and stuff my face with fair food. 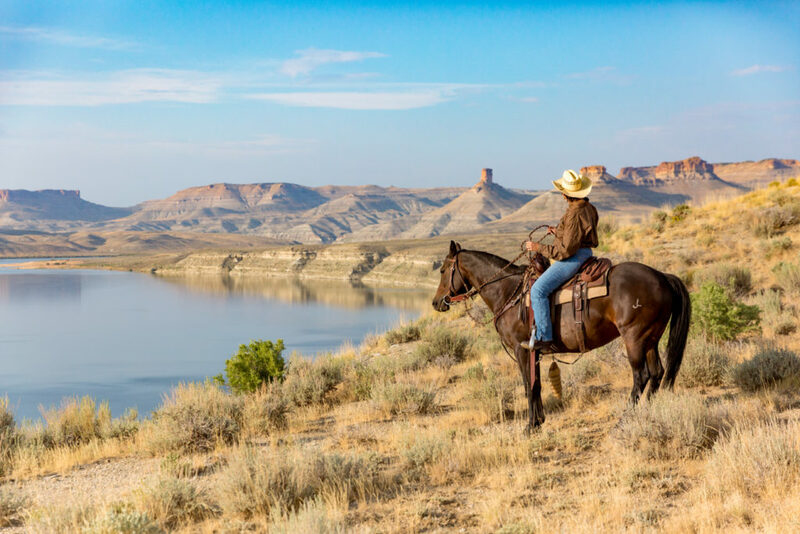 After experiencing one of the best events in southwest Wyoming, it was time to head further south and leave the tiny home behind as I headed down to the Wyoming/Utah border and the Spring Creek Guest Ranch. As I drove south along the Flaming Gorge, the landscape continued to surprise me. I drove over mountains, next to badlands and through deserts before arriving at the guest ranch. Upon my arrival, I was greeted by a sweet woman named Cindy who runs the ranch with her husband. She cooked me up a stir-fry dinner and we chatted about how ranching has changed over the many years she’s spent in this area. She and her husband were the last of a dying breed, but still as raw, real and friendly as they come. After dinner, I headed out for sunset and took a few random dirt roads that twisted and turned over hills, eventually leading me to a view of Flaming Gorge I had all to myself. The next morning, I awoke to a hearty ranch breakfast from Cindy before heading out to explore the area. I ducked down to the southern side of Flaming Gorge to check out the massive dam that formed the reservoir and to learn about the history of this untouched area. After lunch, I headed back north and ventured toward the same dirt roads I had been the night before. There was a freedom and solitude to these dirt roads that touched my soul and before long, I found myself back on the shores of Flaming Gorge. I took a dip in the water before pulling out a chair, a book and a beer to relax the rest of the afternoon. 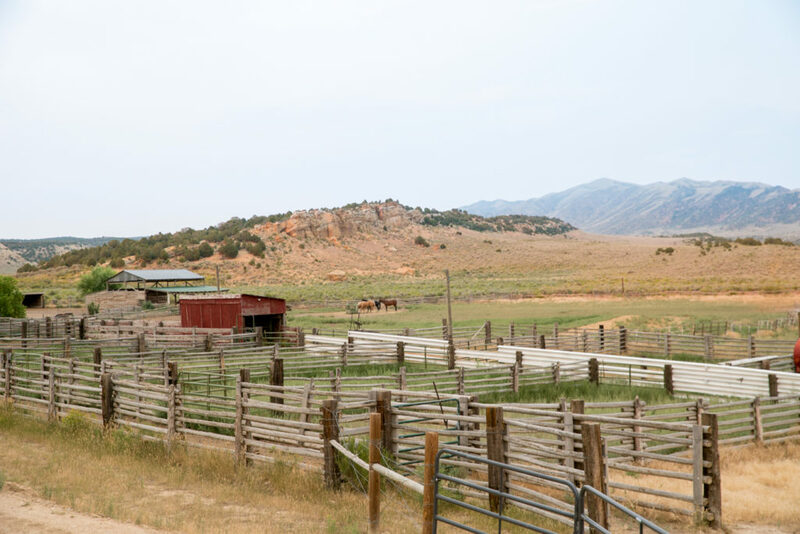 By the time I made it back to Spring Creek Guest Ranch, Cindy had already had the grill fired up and some hearty ribeye steaks to go with a traditional Wyoming ranch meal. Being the only guest here afforded me the opportunity to learn even more about life out here, both the struggles and the triumphs, but one thing was for certain—Cindy never tired of the beautiful views out her front windows. Her heart and soul resided in this area and I could l see the passion she had for this land and the state she called home. One final hearty ranch breakfast and it was time for me to return to Rock Springs. I was sad to leave the peace I felt in this wide-open space, but excited to see what else Sweetwater County had to offer. I joined up with three friends of mine from Cheyenne (one also a fellow native Montanan who now is lucky enough to call Wyoming home) and explored the town of Rock Springs and its rich mining history. We checked out the Rock Springs Historical Museum which provided us more information about the town all the way back to when Butch Cassidy earned his nickname “Butch” from when he worked as a butcher right in the heart of town. I returned to camp for an early night’s rest as the next day would be one of the craziest days of the whole tour. The next morning, the alarm went off at 4 a.m. and I rolled out of bed ready for a busy and epic day ahead. This time I was joined by my buddy and videographer, Hazer Novich. Hazer joined me on my first tour of Wyoming and now was back to help me finish out this tour as well. 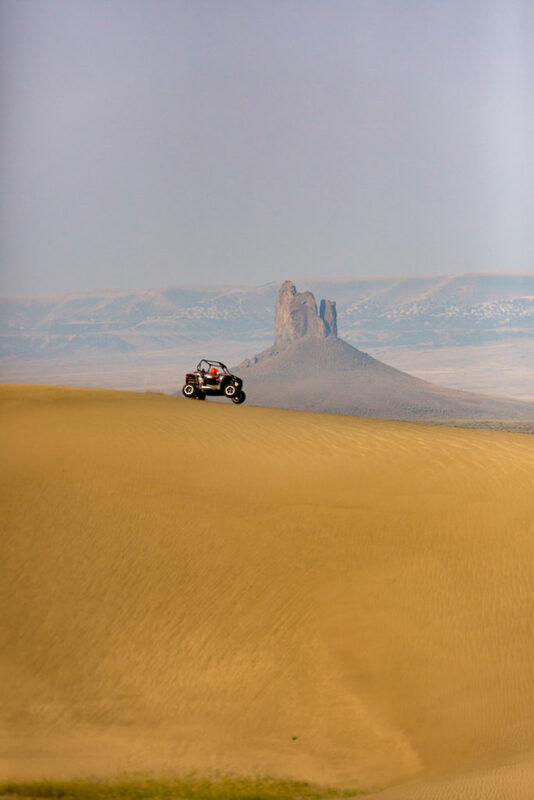 We kicked off the day by driving north to the Killpecker Sand Dunes with a Polaris UTV in tow. This was my first time rallying a UTV, but Hazer was an experienced veteran of the motorized outdoor world. After a few quick lessons from Hazer, I was off doing donuts and wall riding dunes. It was new world for me, but one I’m eager to get back to. That evening we returned to camp and met up with some Sweetwater County locals who brought out horses for an evening ride. I grew up around horses and loved riding growing up, so this was a treat for me. We rode up Firehole Canyon to some dramatic overlooks and watched the afternoon storms part way to a beautiful sunset. After the ride, we came back to the horse trailer where a bottle of Pendelton Whiskey was waiting. We shared swigs from the bottle and told stories of Montana and Wyoming with our new riding partners. As it turned out, Janet’s (who took us riding) husband was from the same small valley in Montana as Hazer. The stories and the whiskey lasted long after the sun set and I was reminded why I love the simplicity of this life. It was a long day, but one that will stand out as a favorite from the trip. My last day of the #CalloftheWY tour I headed out for a drive up the Pilot Butte Wild Horse Scenic Loop. The views stretched from looking down on Rock Springs to the Wind River Range in the distance. As I drove the road I came across the herd of wild horses that give this road its name. 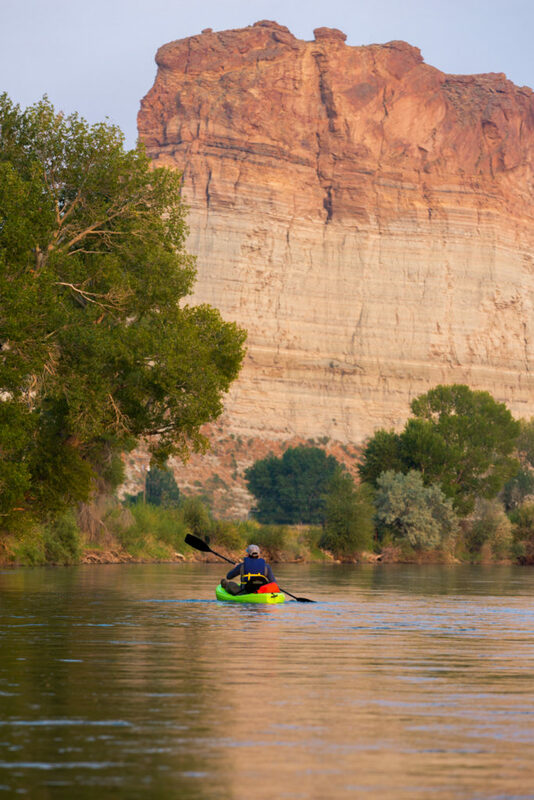 To finish up the trip Hazer and I rented a pair of kayaks and put them in the Green River to float through town. The beautiful high rock walls that line town made a perfect backdrop for our last night of an amazing tour around Wyoming. So there you have it! Three amazing weeks summed up in three blogs, check out my first week in Lander here, and my second week in Pinedale here). While my blogs are done, keep an eye out for the many photo, stories, and videos to come soon! But for now, happy adventuring and thanks for following my journey! P.S. Here are my tips for visiting Sweetwater County! -Don’t be afraid to get off the beaten path in this corner of southwest Wyoming. The backroads that meander in and around Sweetwater County lead to some of the most spectacular views in the region.